At funerals in New Orleans, a marching jazz band sometimes accompanies a coffin through the city, playing in a slow and sombre mood on the way to the cemetry. Coming home however, the band jumps into Dixieland tempo, which is happy and bouncy. Let’s look at the tab and learn how to play things Dixieland Jazz style. Purple music is for four hole harmonicas. Orange music is for ten hole harmonicas. The number tells you which hole to play. D is draw (breath in). B is blow (breath out). Let’s listen to the whole tune first. 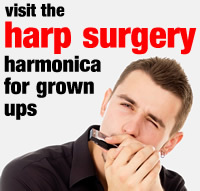 We’re using a C major harmonica. The biggest celebration of the year in New Orleans is Mardi Gras. In English this is Shrove Tuesday, or Pancake Day. In other countries, it’s Carnival. 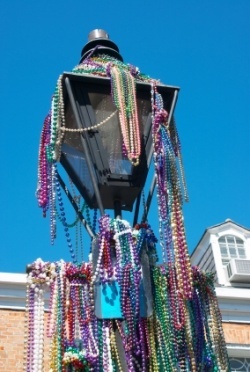 Mardi Gras marks the start of Lent when people used to fast before Easter. Nowadays people try to give something up for Lent, like chocolate. Then they go crazy when the Easter Bunny comes to call! So here’s a song you can play at any time for fun, but especially around Easter. Put it all together, sharpen it up and find some friends to play along with. 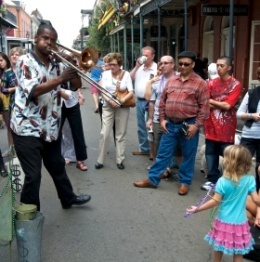 You can even try marching in a rythmic style while you play, just like a New Orleans Jazz Band. 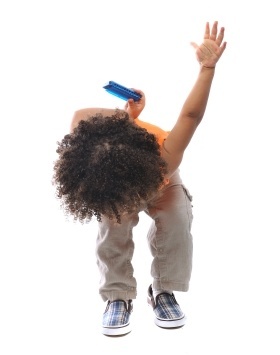 Well done – take a bow!